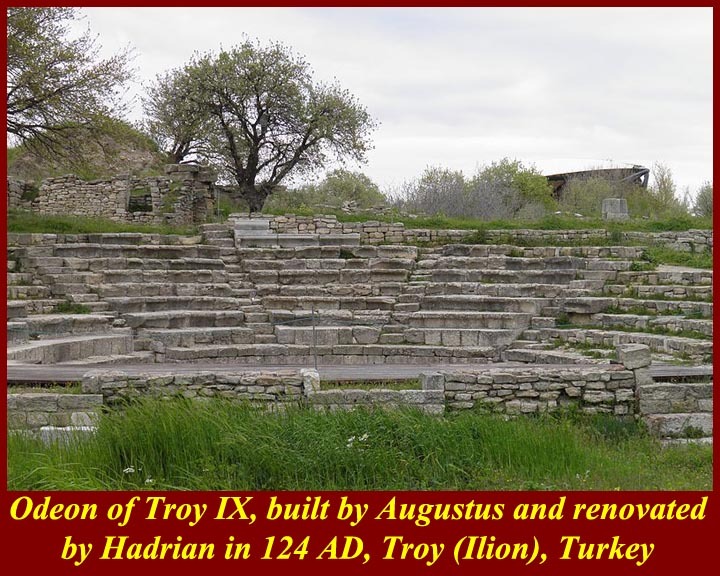 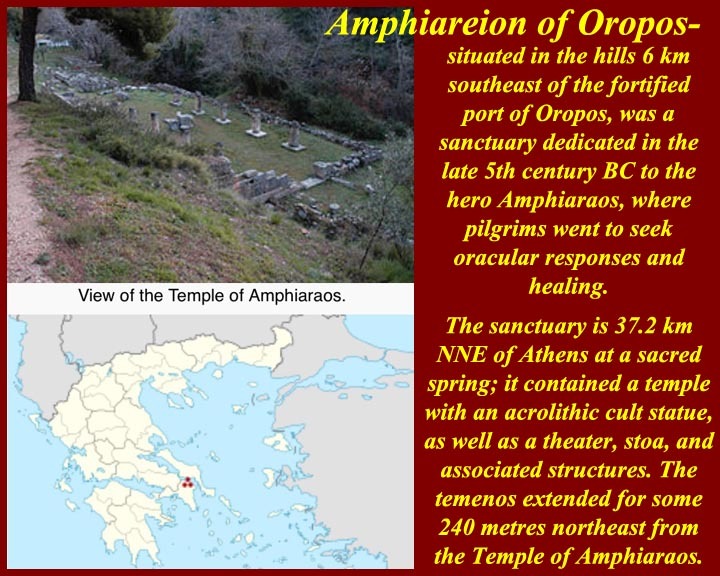 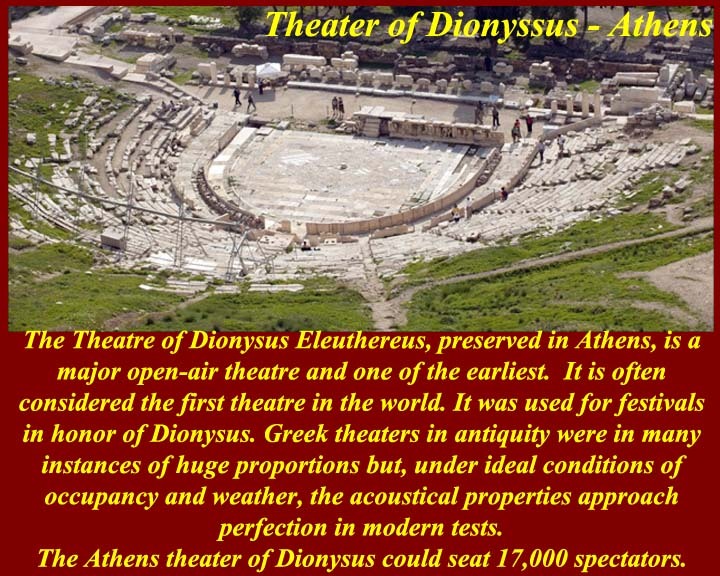 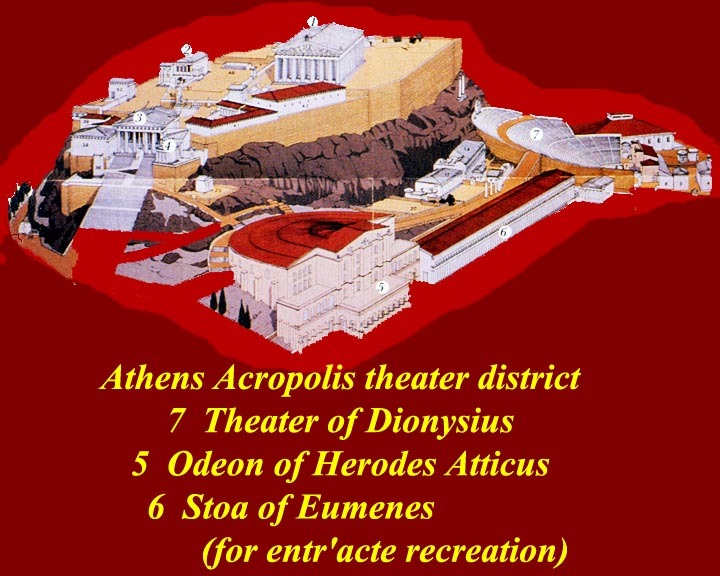 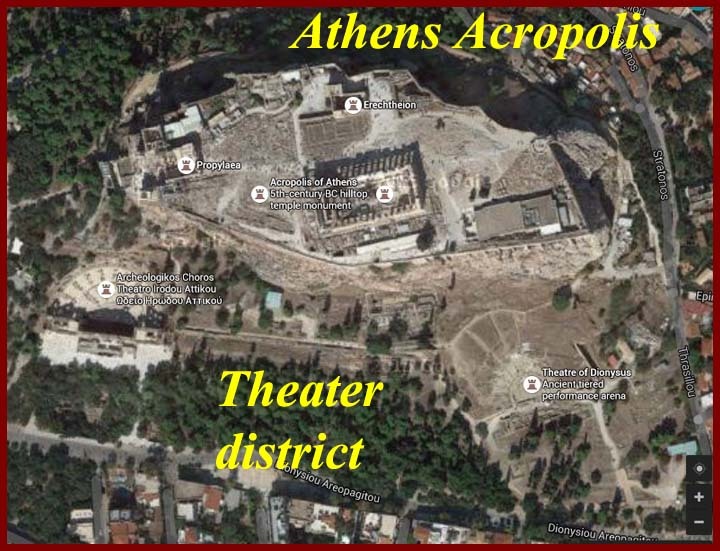 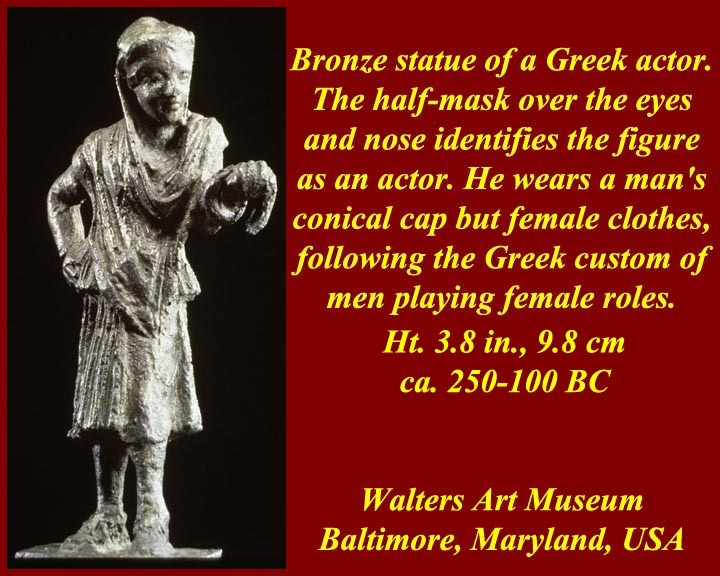 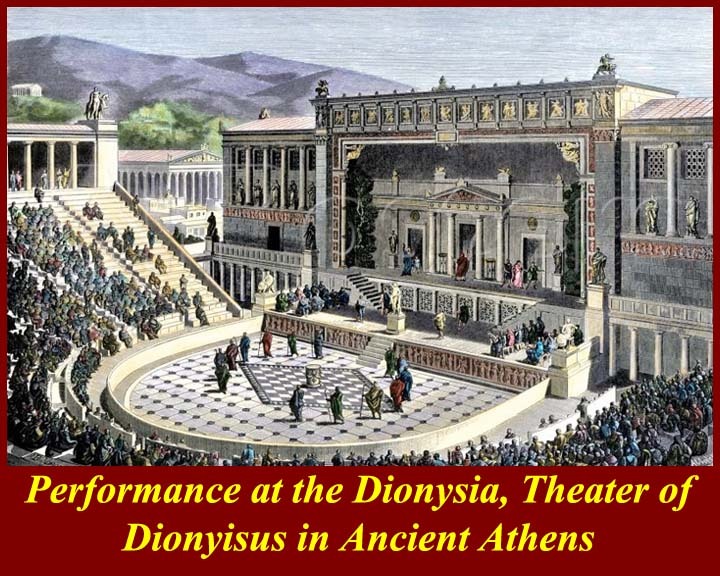 The city-state of Athens, which became the predominant cultural, political, and military power during this period, was the theater center, where theater was institutionalised as part of a festival called the Dionysia, which honored the god Dionysus. 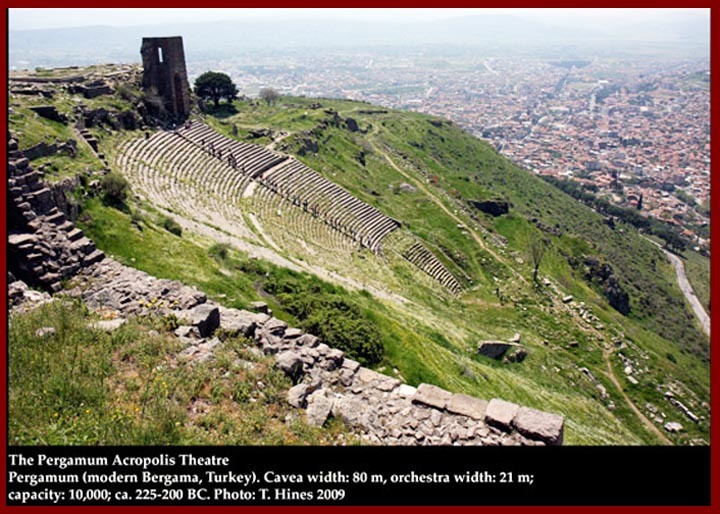 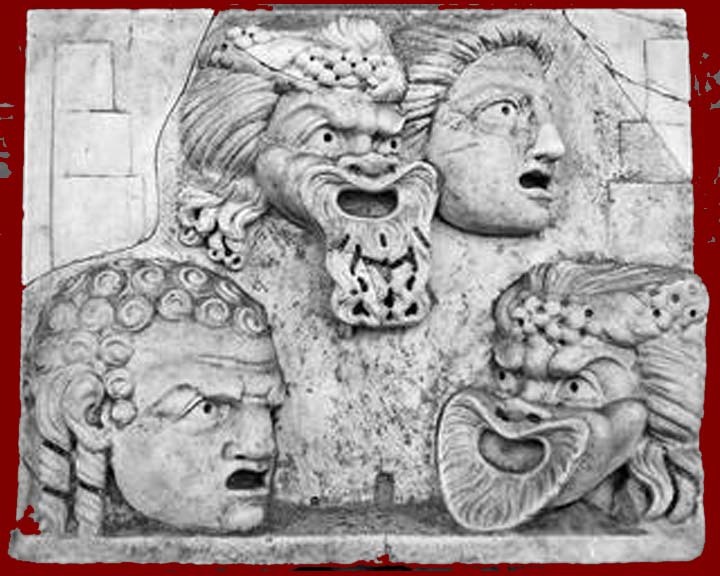 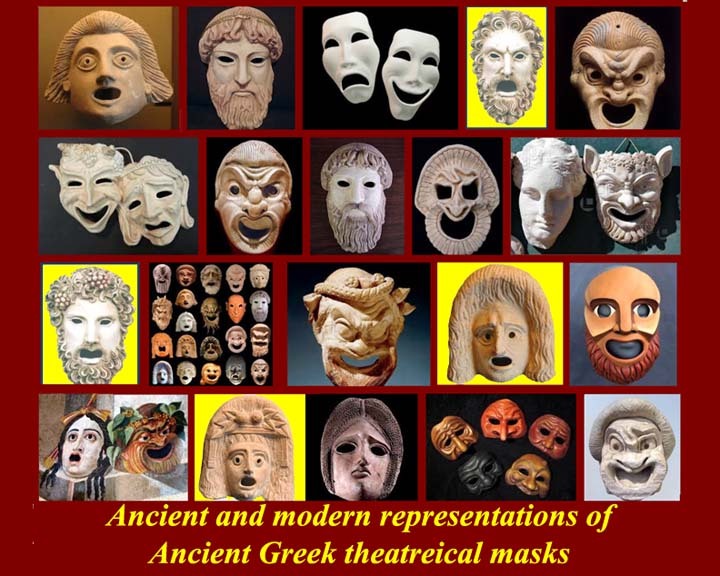 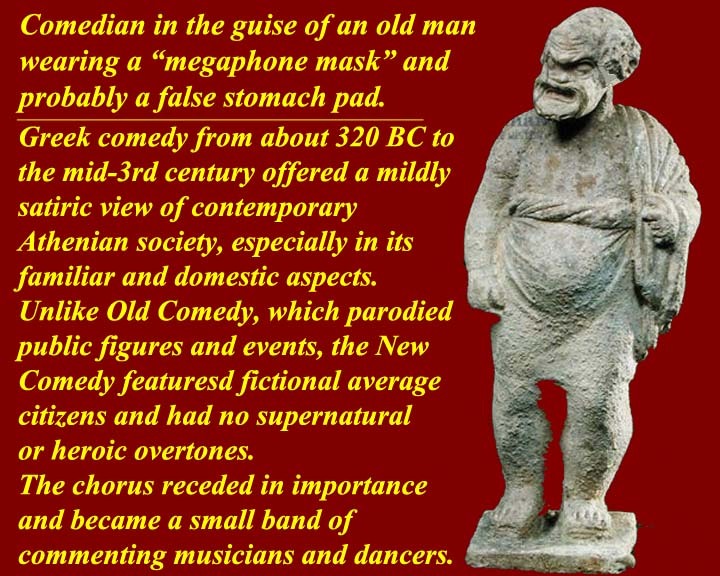 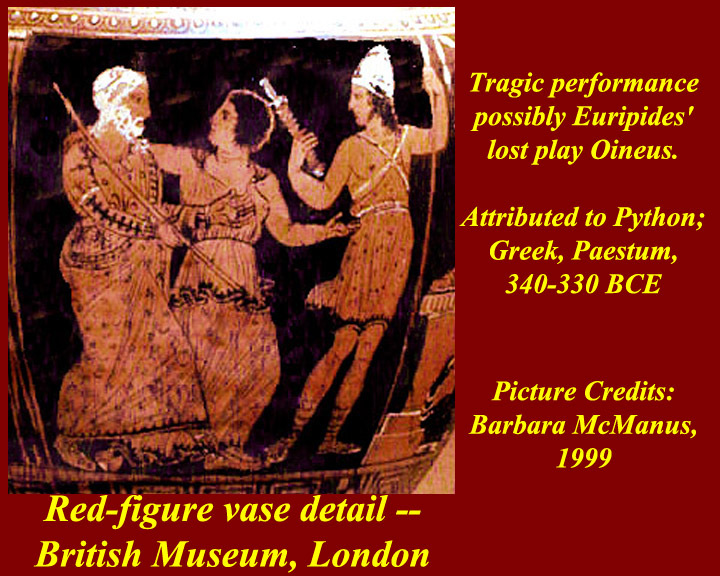 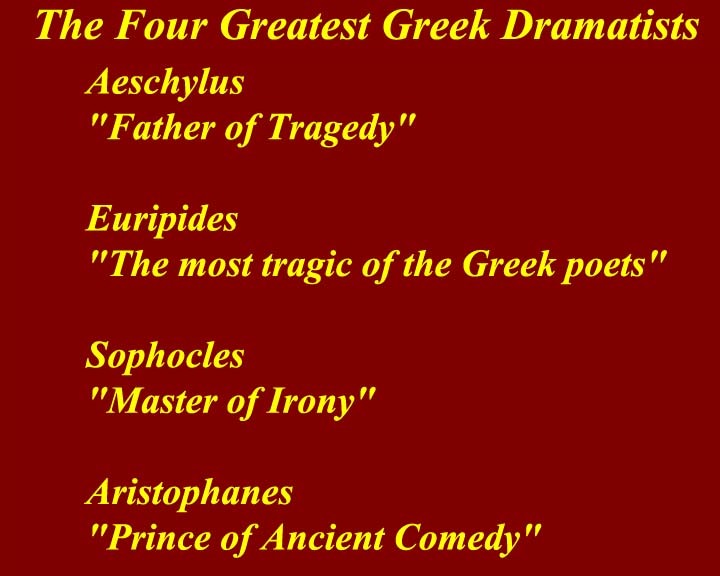 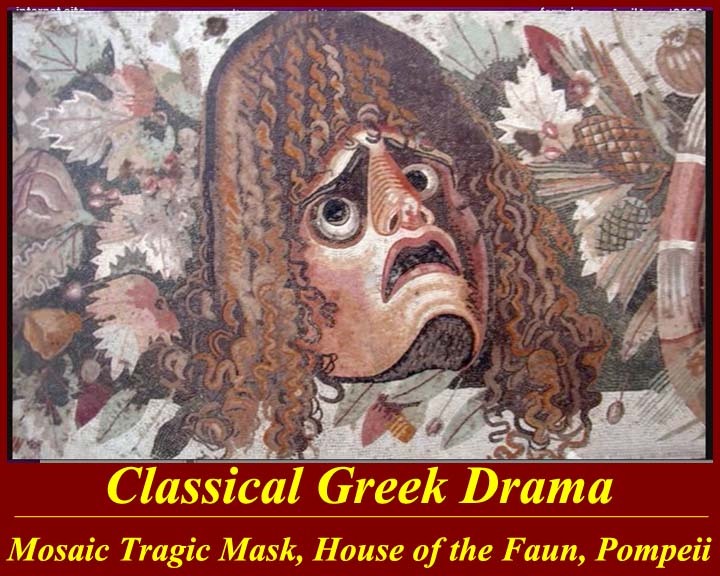 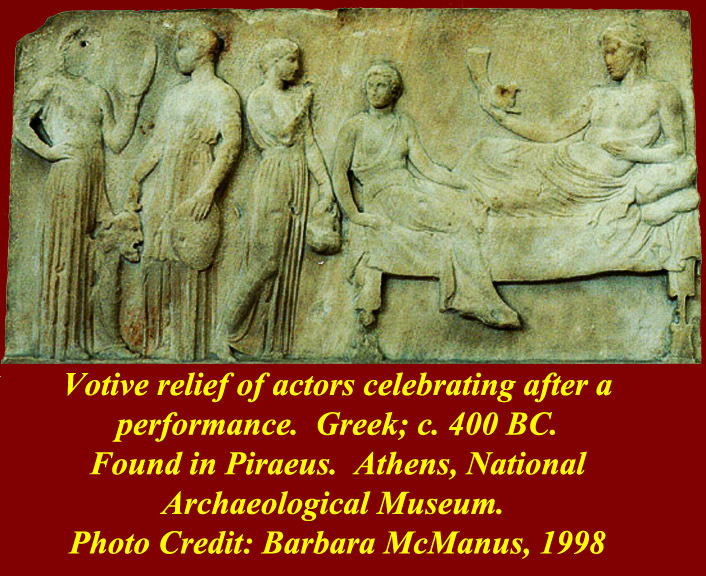 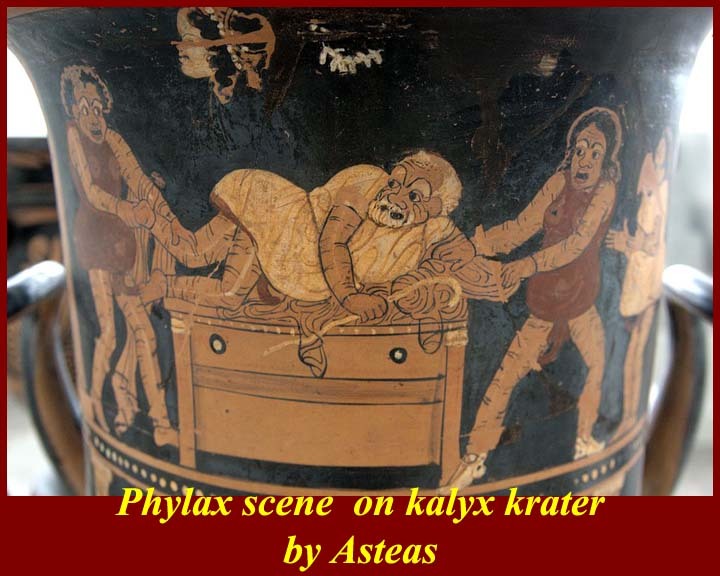 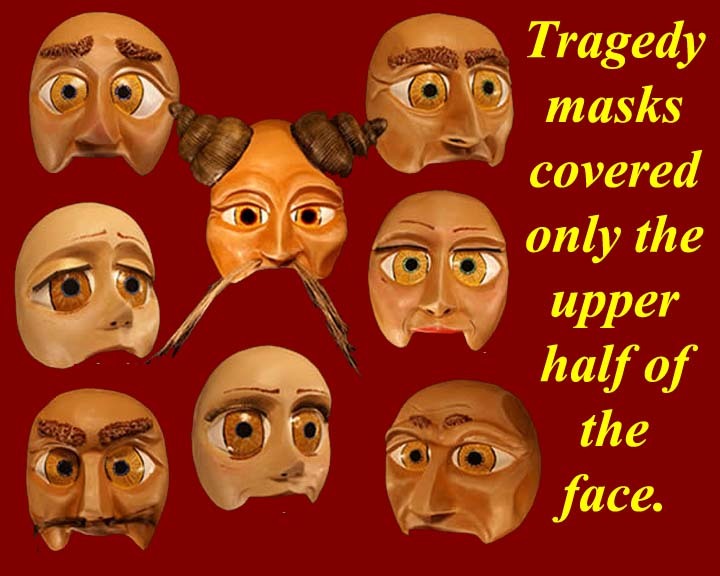 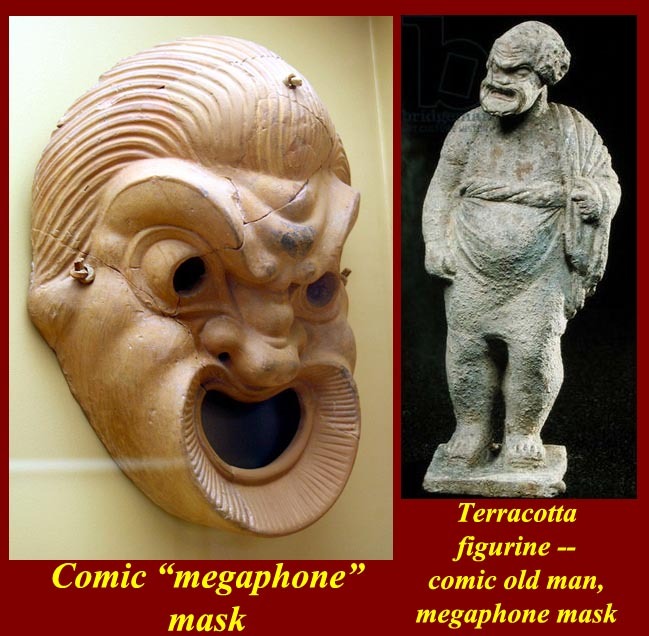 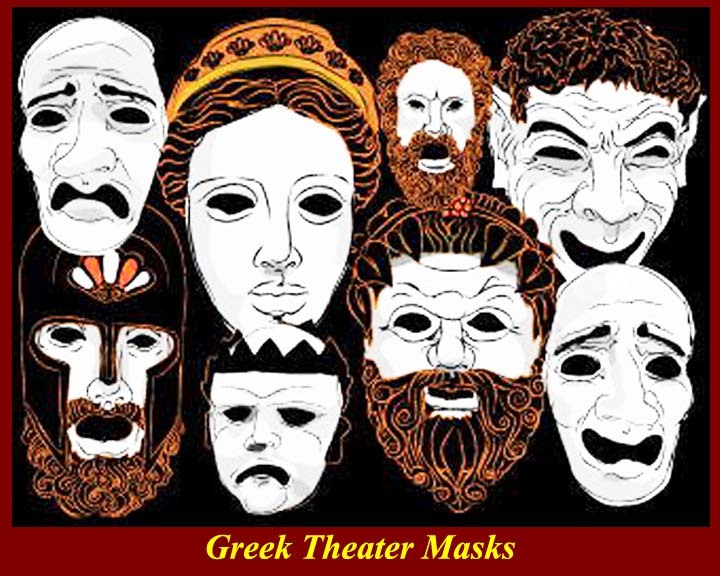 Tragedy (late 500s BC), comedy (490 BC), and the satyr play were the three dramatic genres to emerge in Athens. 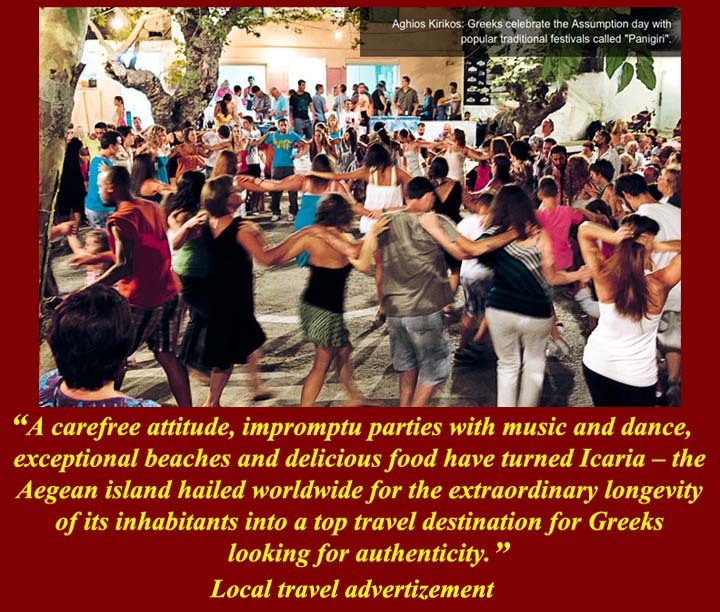 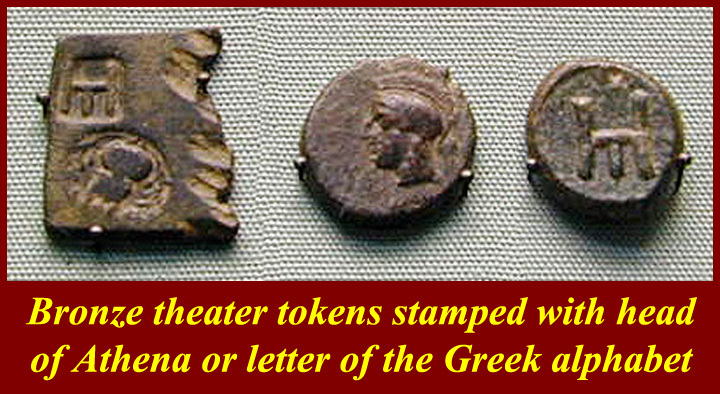 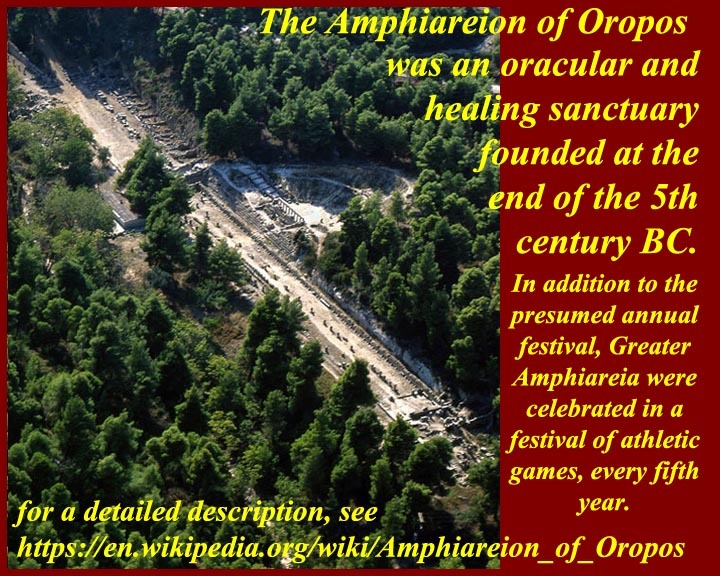 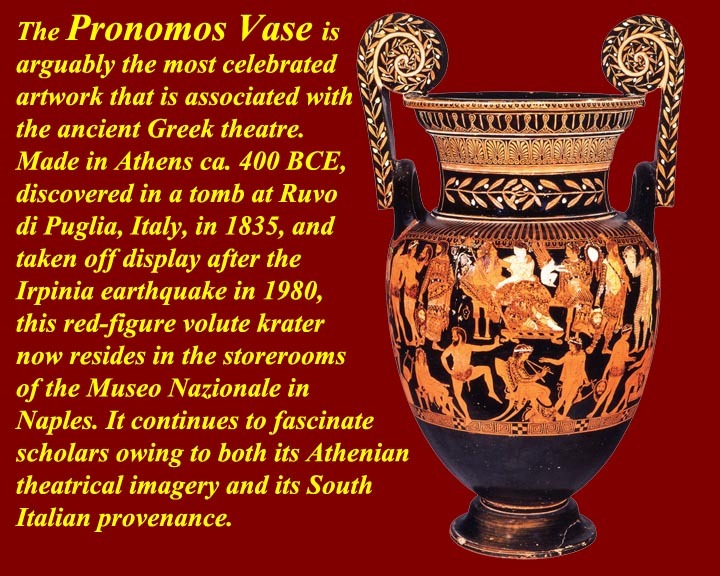 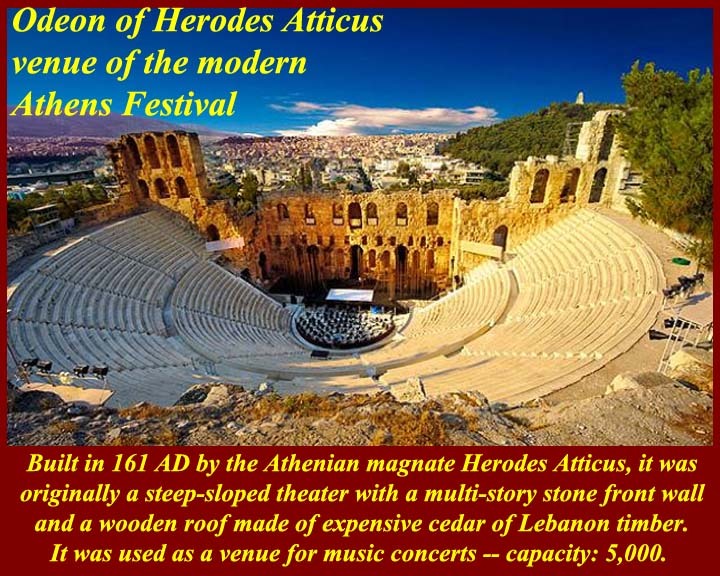 Athens exported the festival to its numerous colonies and allies in order to promote a common cultural identity. 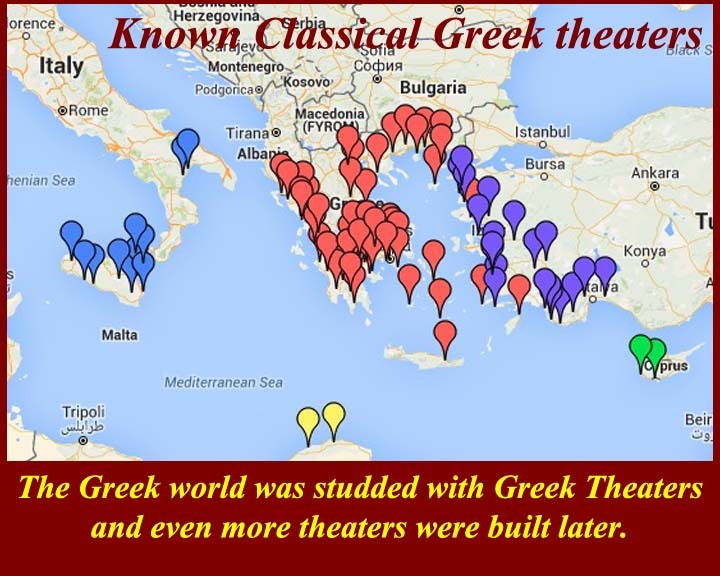 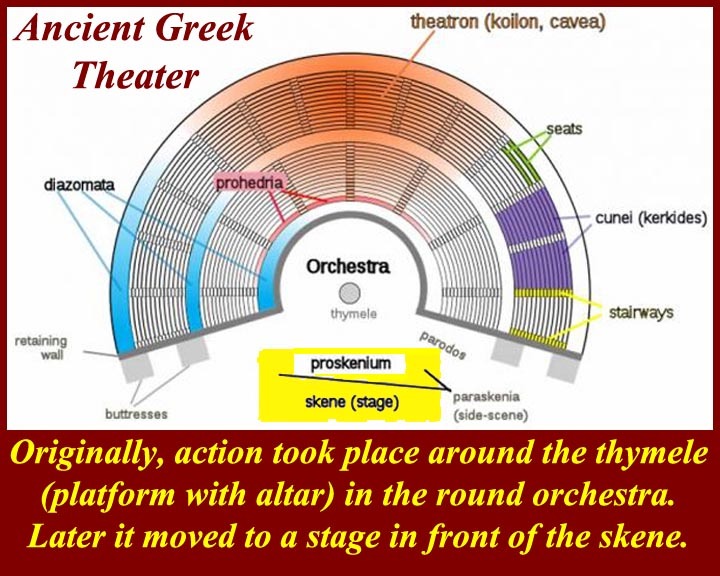 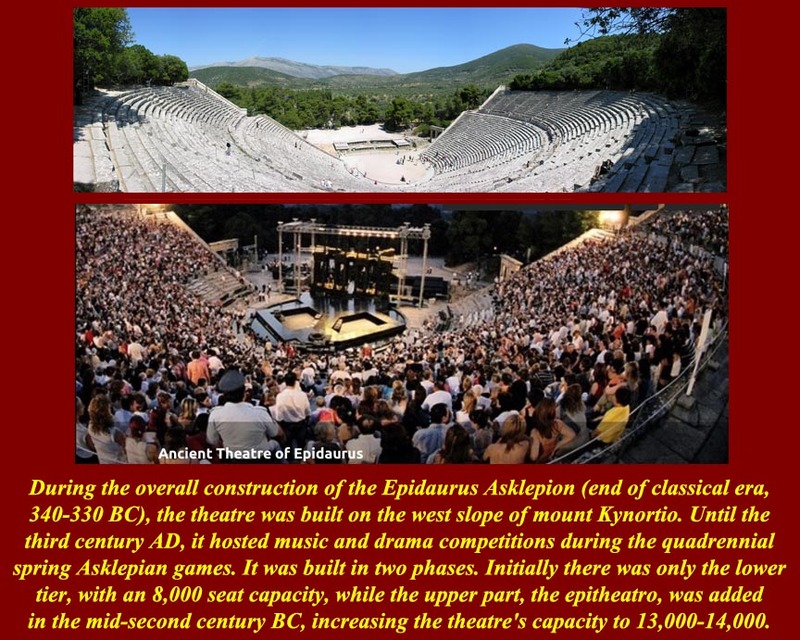 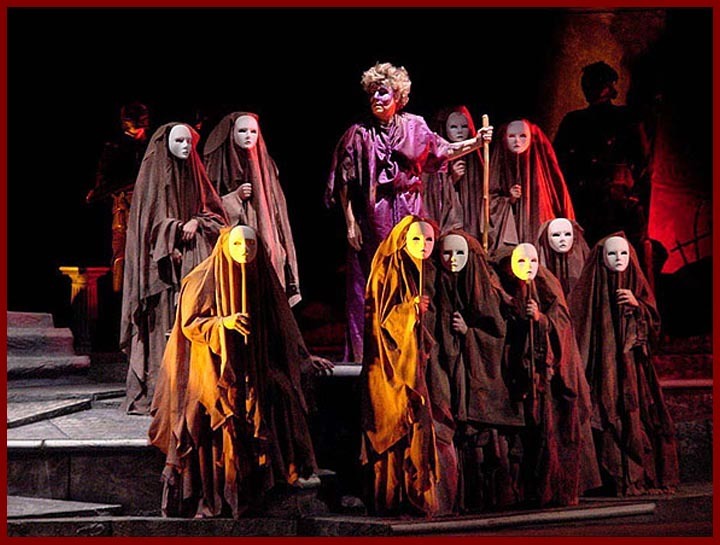 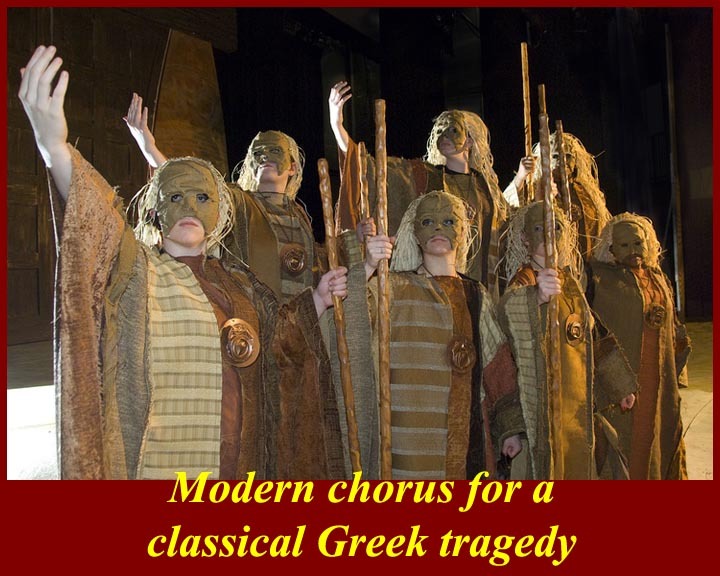 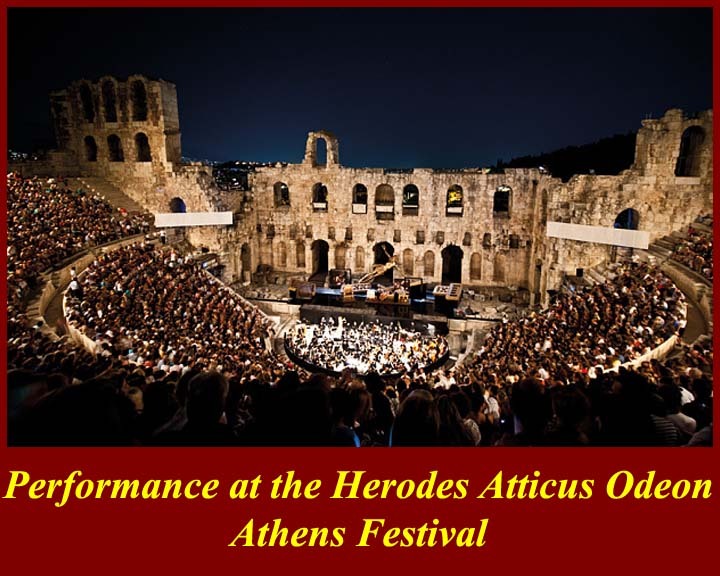 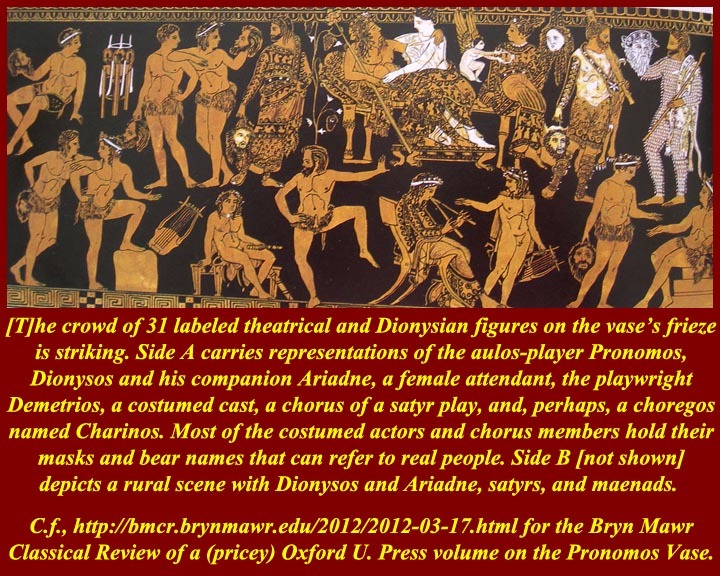 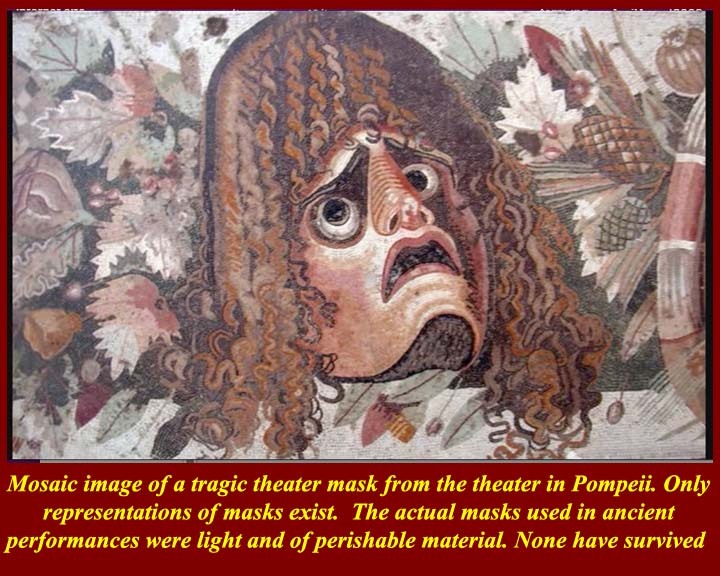 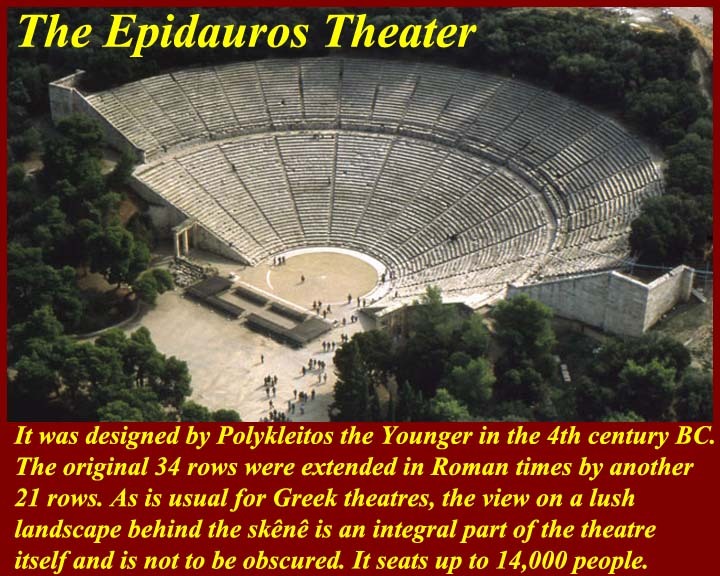 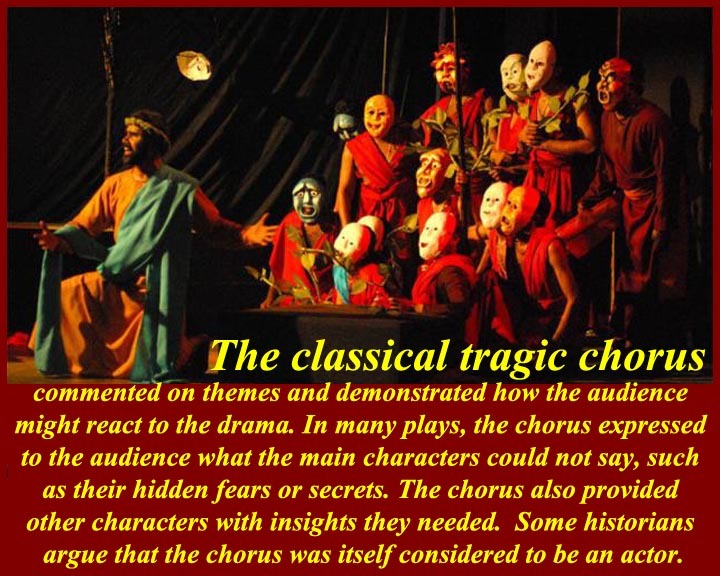 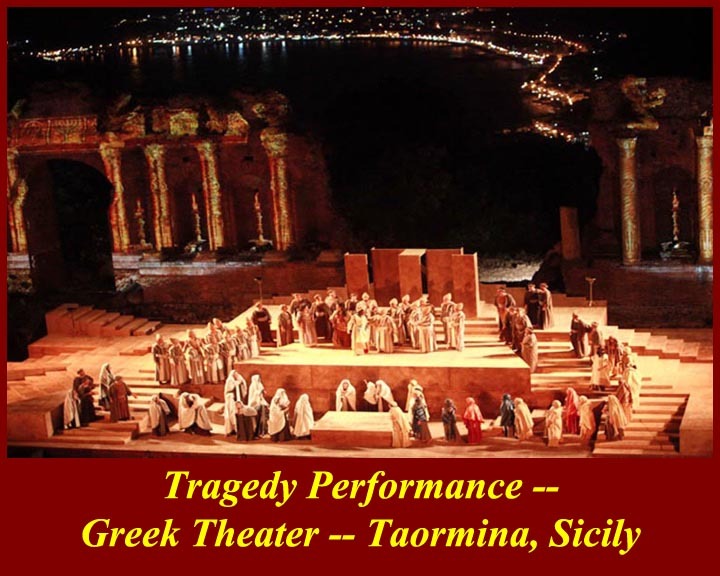 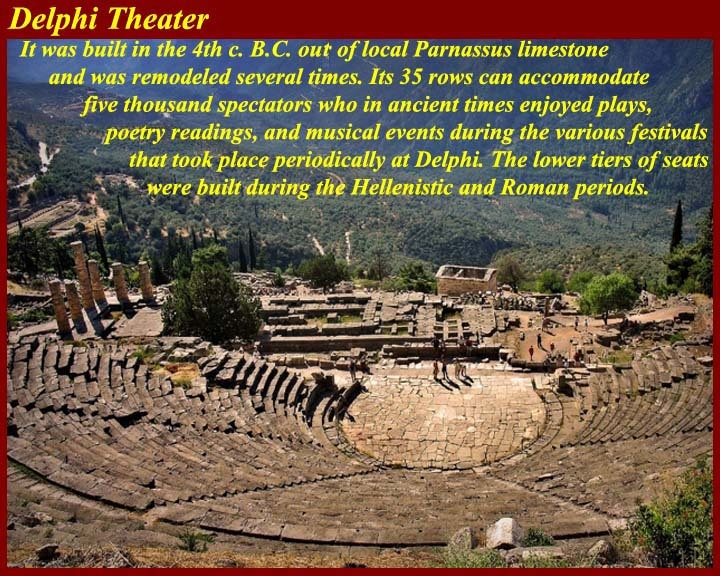 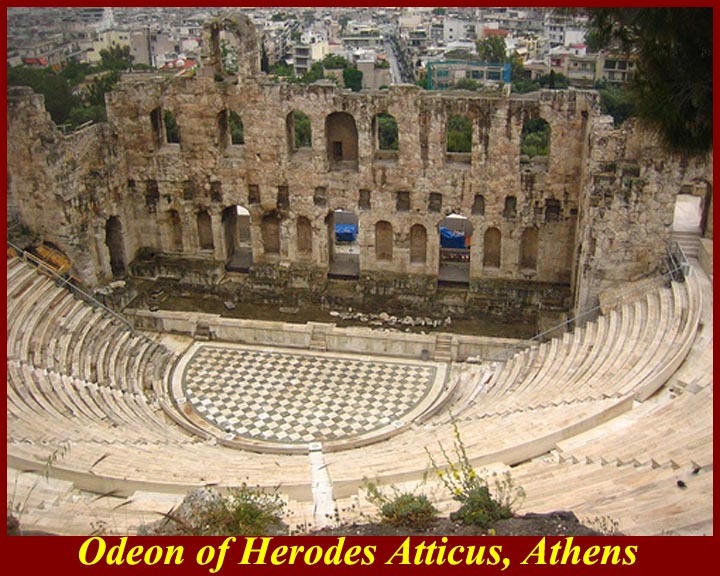 Theater in Greece developed from cultic Dionysian rituals called Dithyrhambs (50 naked or almost naked men/boys circling an chanting prayer poems, which could end with sexual encounters among participants and the audience). 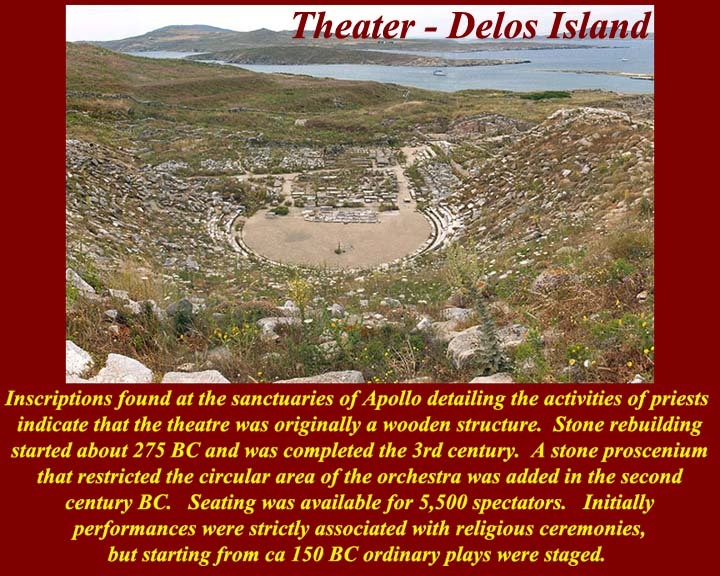 Dithyrhambs were sung by choruses at Delos, but the literary fragments that have survived are largely Athenian. 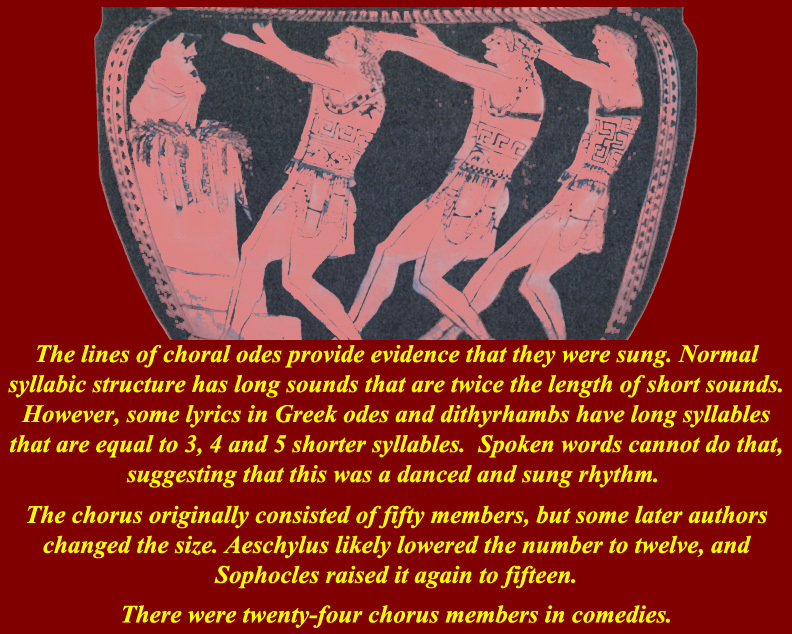 In Athens, dithyrambs were sung by a Greek chorus dancing in circular formation, who may or may not have been dressed as Satyrs, probably accompanied by the aulos. 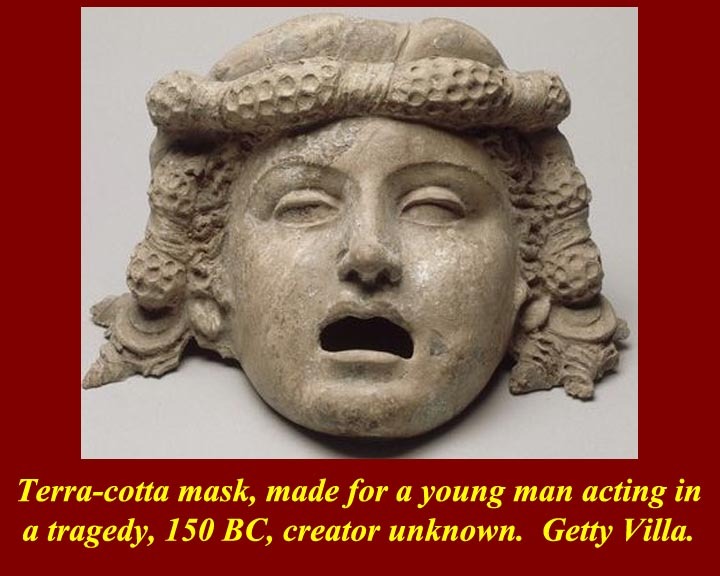 They would normally relate some incident in the life of Dionysus or just celebrate wine and fertility. 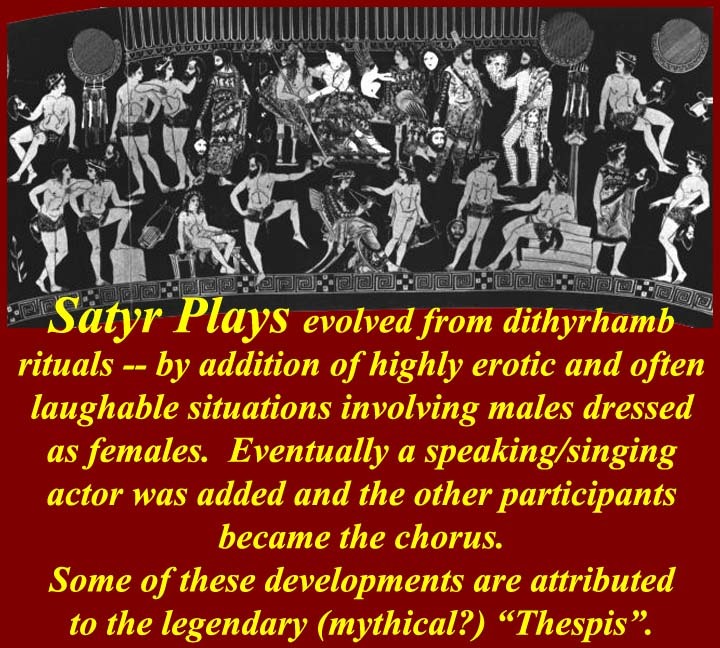 From the dithyrhambs developed the satyr plays which included plot elements/action that mocked gods and heroes. 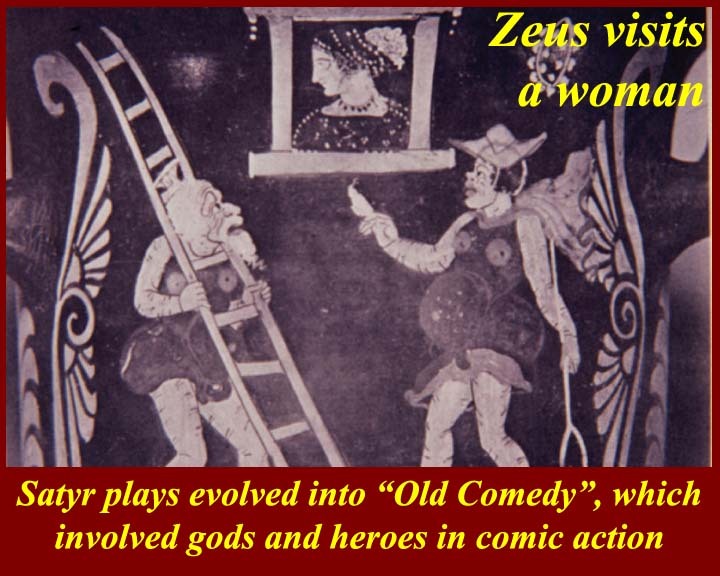 And from that developed "old comedy", in which the action concentrated on the adventures (=misadventures) of gods and heroes. 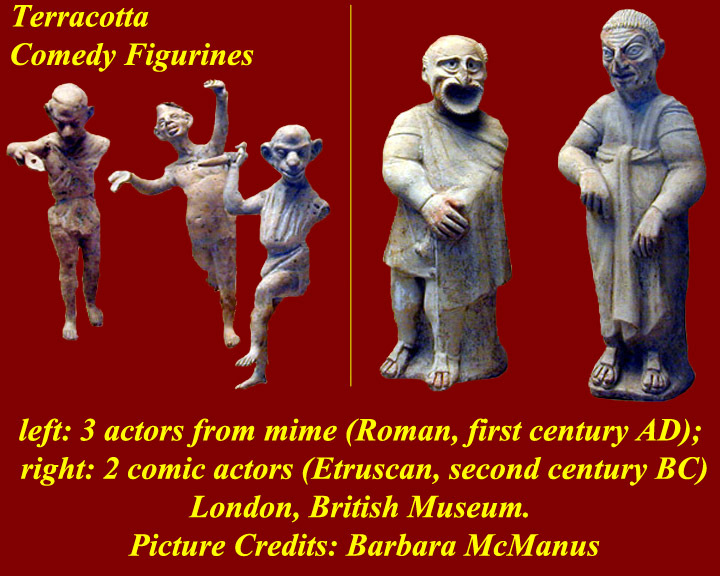 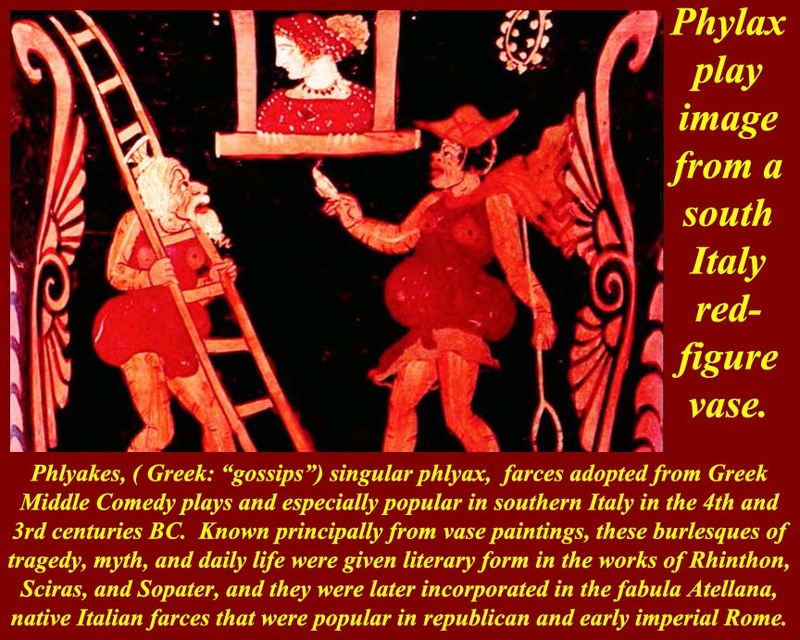 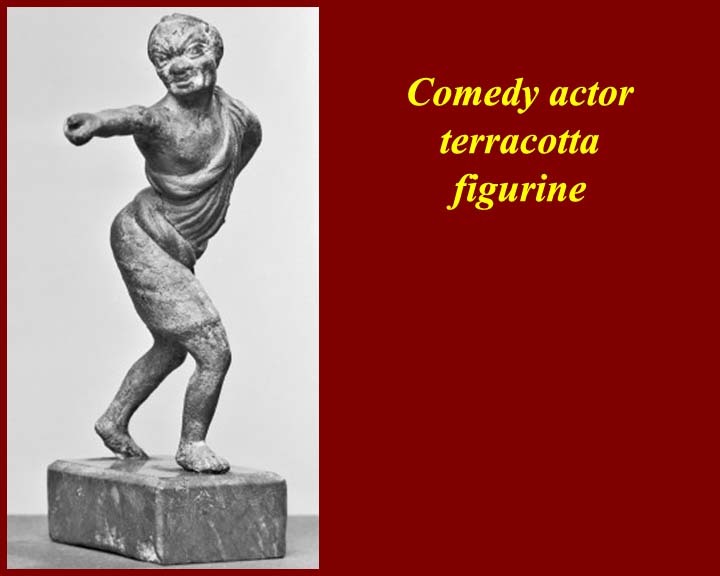 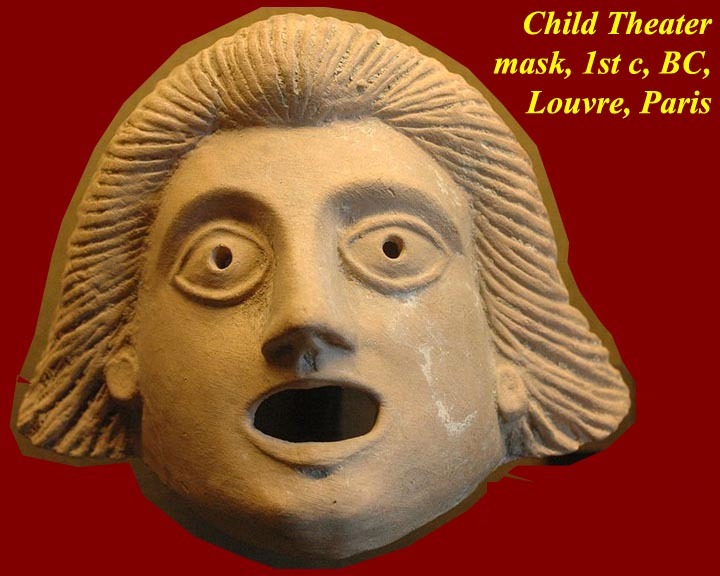 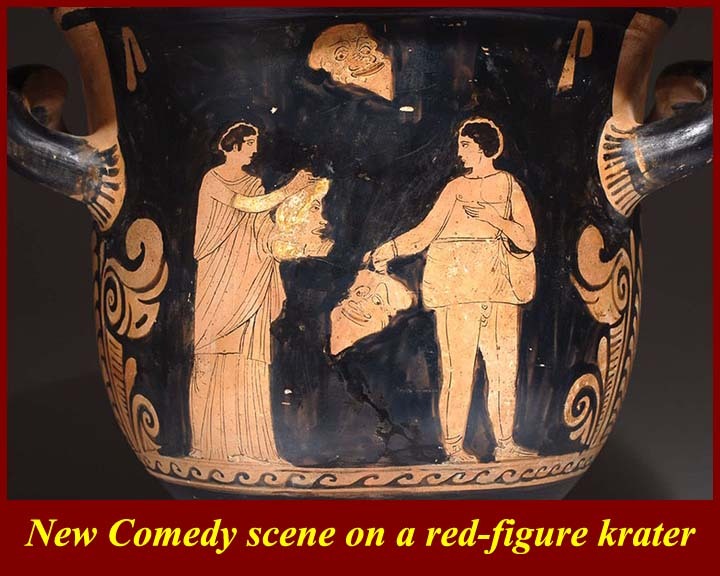 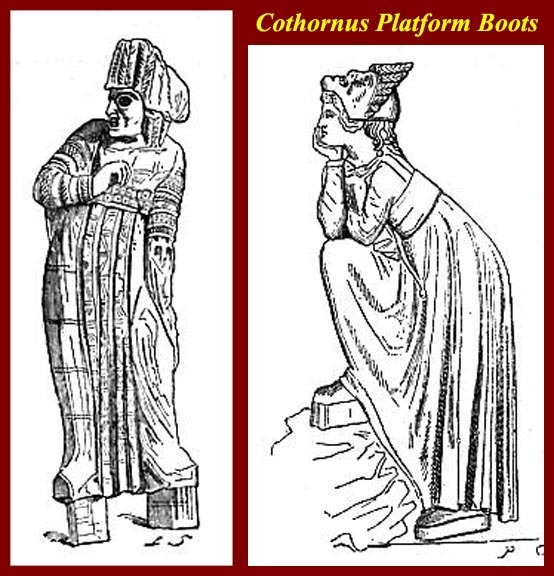 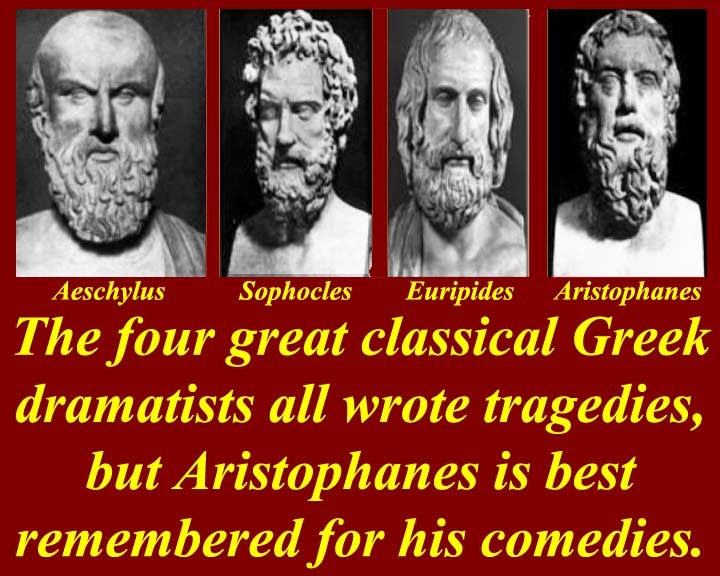 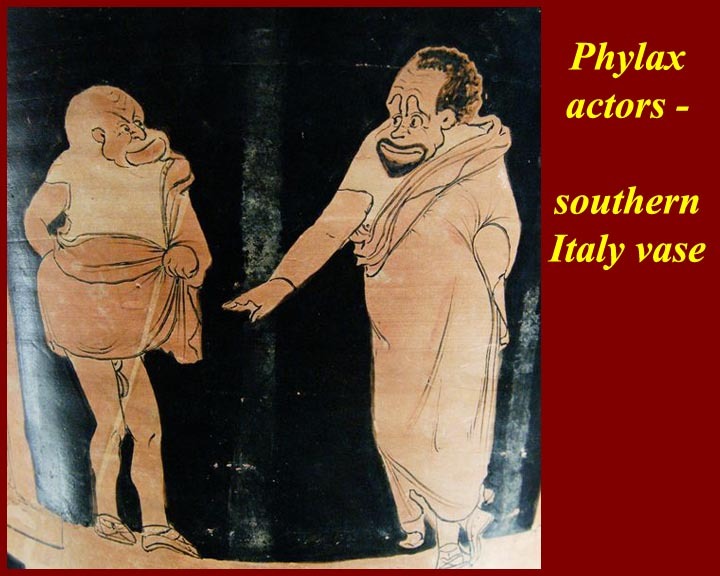 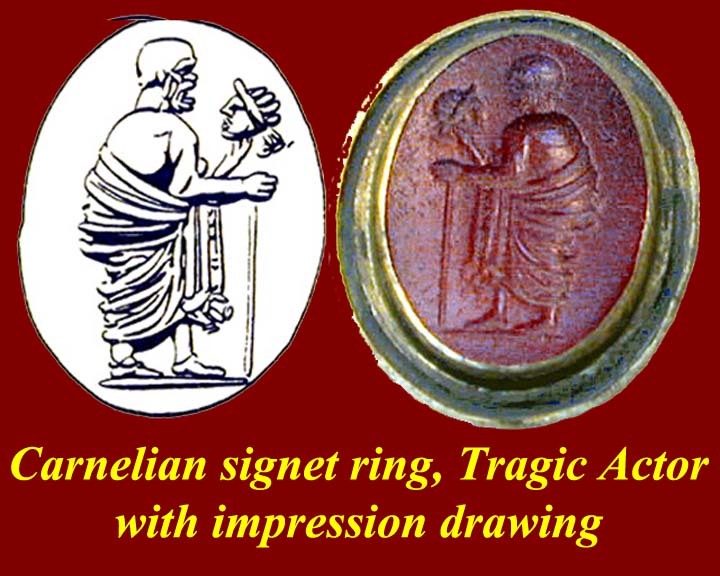 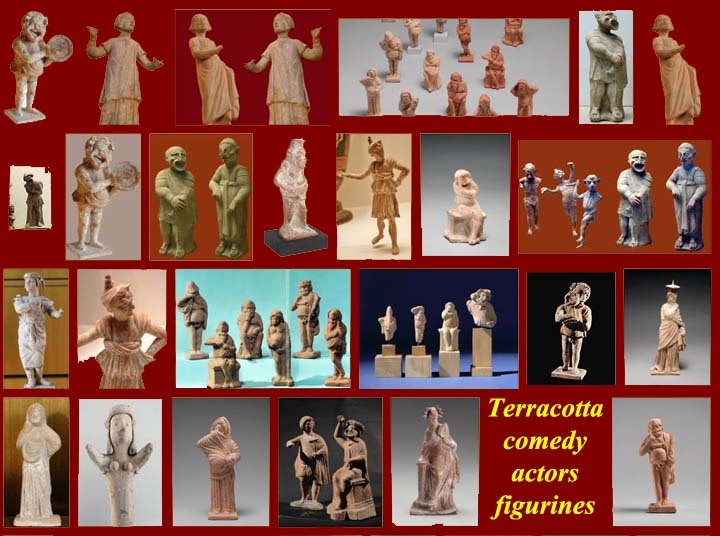 New comedy developed from old comedy late in the 4th century with and intermediate and mixed period (not quite old or new) which ancient historians of drama labeled, as only historians might lable it, "middle comedy". 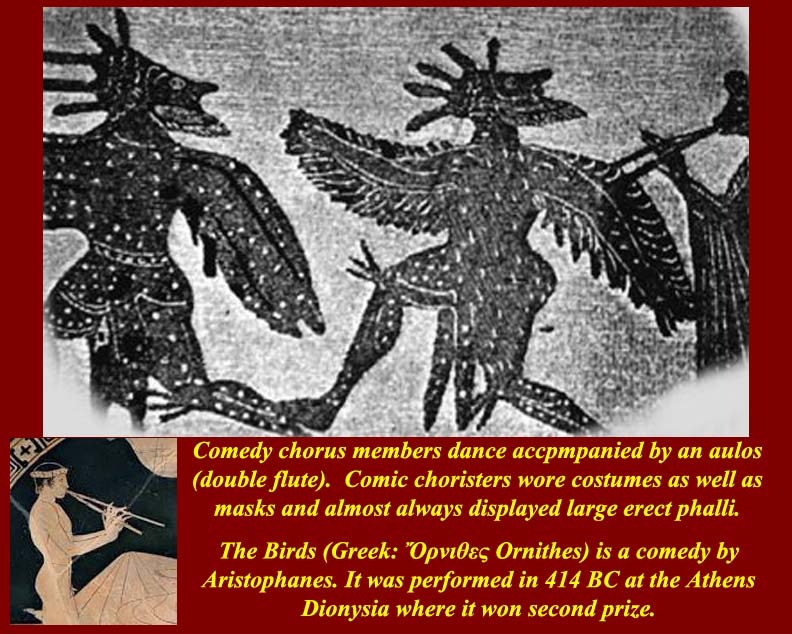 At some time in the late 6th century an actor was added to sing antiphonally with the chorus. 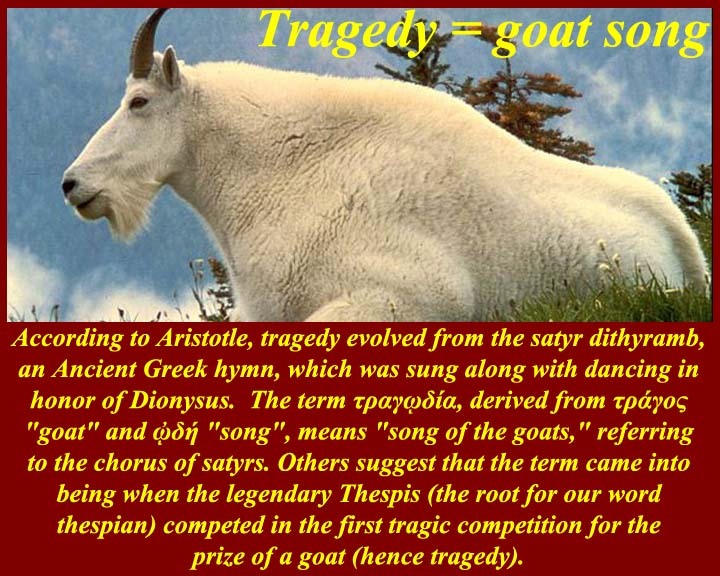 According to legend, again in the 6th century, a producer/director/actor named "Thespis" (whence, "Thespian") is said to have invented tragedy (which means "goat song") and won a goat at the Dionysia contest in Athens. 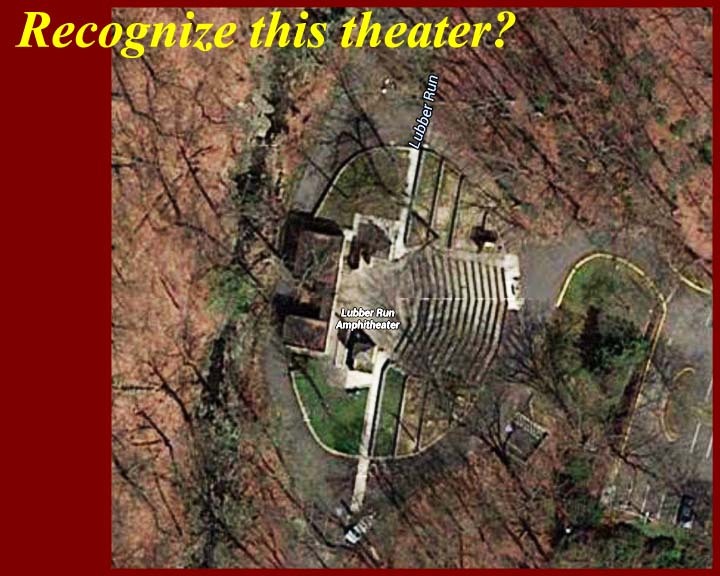 The detail of development of theater structures is much discussed, but the consensus seems to be that folks just sat on sloping hillsides watching what was going on at the temples that were in valley bottoms or watching some phenomenon (think of the Niagara Falls Observation Tower or Niagra Falls Crows Nest). 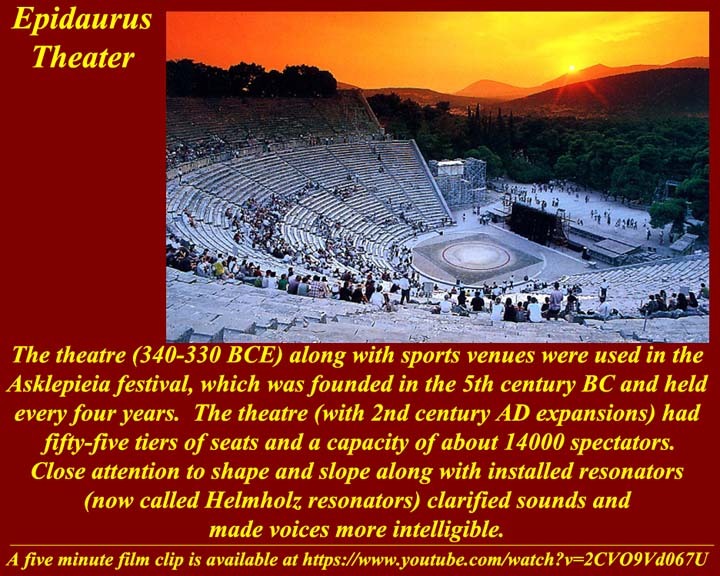 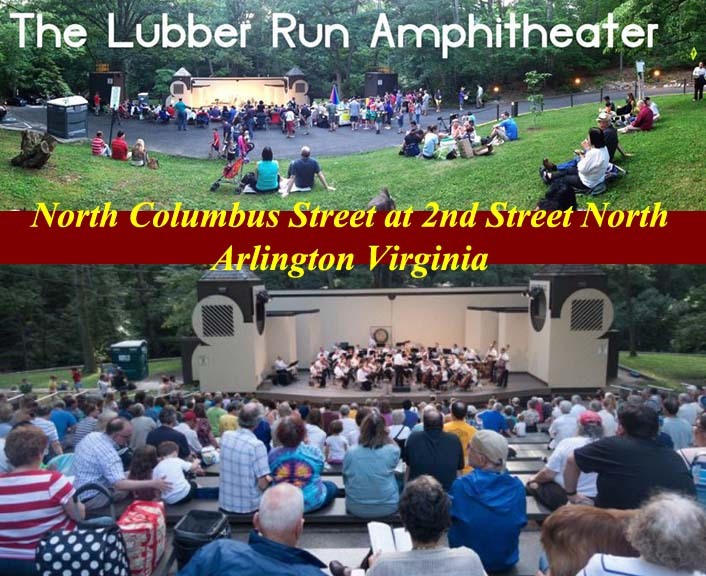 Aspiring politicians or tourism boards seem to have recognized that supplying seats/benches for the audience might increase the politician's influence ir the inflow of lucre from tourism. 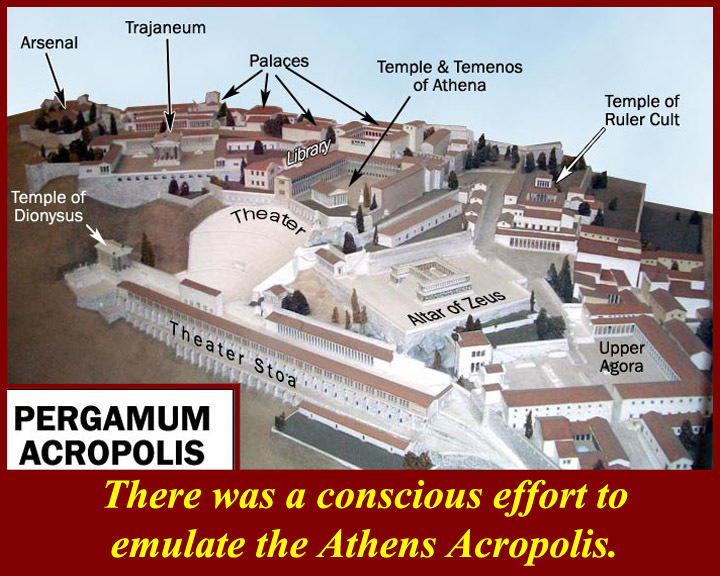 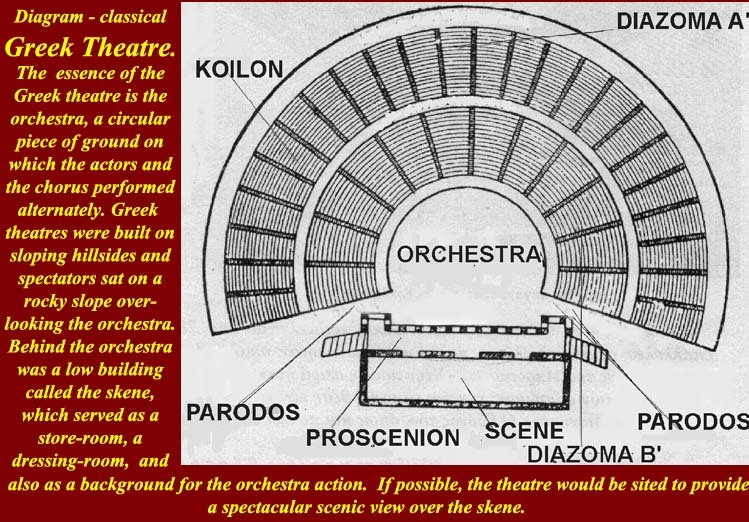 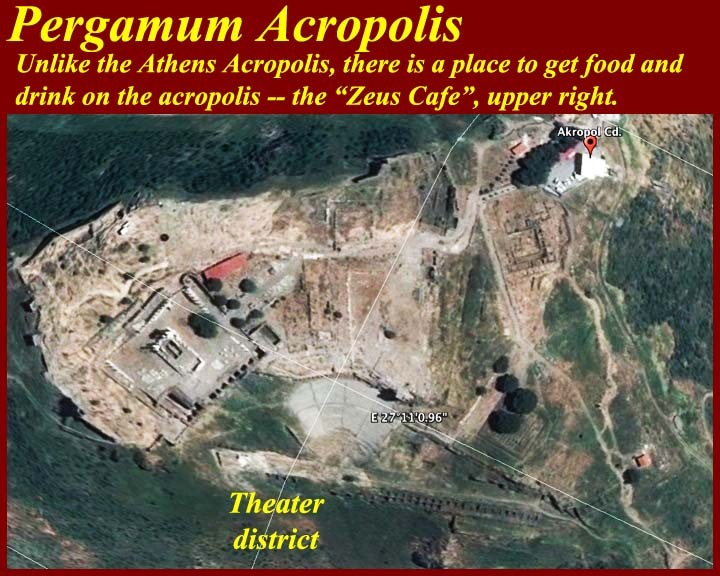 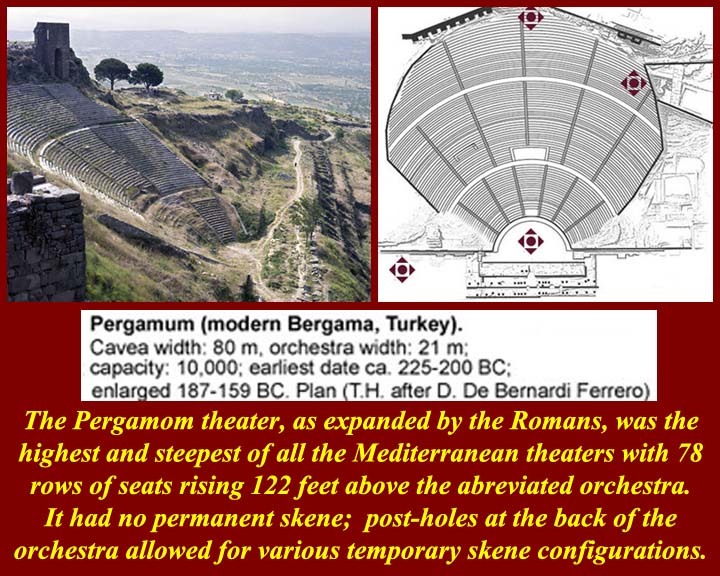 And the formal "theatron" (meaning a place for watching) was born. 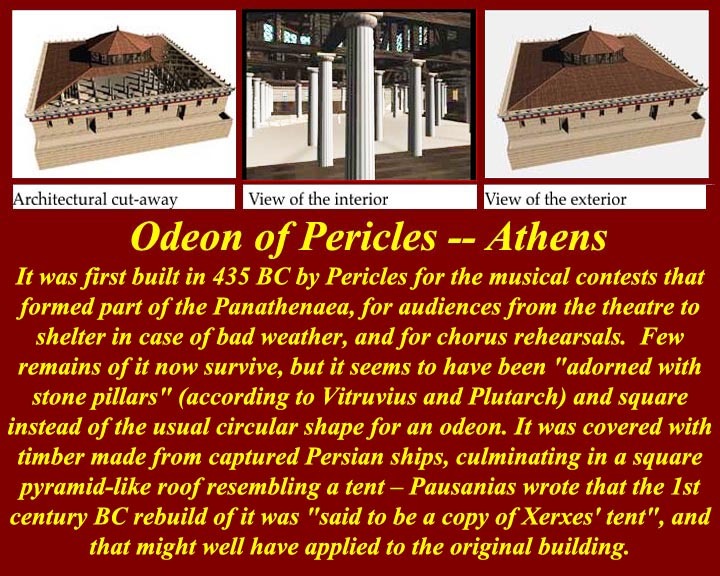 We start with the buildings.